Want to say it with flowers? Sending a floral bouquet is a great way to add a little romance to your day. And with a Post A Rose voucher, you can enjoy fantastic savings on every order. So whether you want to treat that special someone to a single red rose or make your mum smile with a bunch of tulips, a Post A Rose discount code is a great way send your choice of flowers without spending a fortune. Post A Rose enjoys a long, rich history stretching as far back as 1886, when the family-run floristry business Robinson's Ltd. opened its doors. Starting life as a nursery selling cut flowers, fruit and vegetables through two shops in Douglas on the Isle of Man, the company has grown in popularity over the years. In 2000, they launched the Post A Rose website, initially specialising in sending the finest quality roses to addresses throughout the UK. Today, the business is thriving, with a wide range of bouquets, indoor plants, gifts and even luxury Isle of Man hampers available to purchase online. At Post A Rose's comprehensive website customers can browse hundreds of flowers and gifts that can be delivered for free to any address in the UK. As well as the eponymous roses, customers can choose from seasonal bouquets, house plants, special occasion flowers and much more. So whether you want to send a romantic single red rose or a whole bunch of a loved one's favourite flowers, Post A Rose will help you to make someone's day. Planning a wedding or another special event? Post A Rose also offer a bulk delivery service that allows you to take a DIY approach to your flowers. You can take your pick from a wide range of quality flowers, then order them to be delivered to your door the day before your event – ready to be arranged however you desire. This is great for brides that want to save money on flowers but still have beautiful blooms for their special day, as well as anyone that wants to get involved in the flower arranging for their event. All of Post A Rose's flowers and bouquets are sourced from established nurseries in the UK and the Netherlands and packed fresh at the company's nursery on the Isle of Man. Want to get shopping with Post A Rose? With a Post A Rose voucher you can enjoy fantastic savings on their wide range of flowers, bouquets and gifts. So whether you want to spoil someone you love with flowers or treat yourself to an indulgent hamper packed with treats from the Isle of Man, a Post A Rose voucher code is a great way to shop without spending a fortune. Browse our website until you find a Post A Rose voucher that suits you, then navigate to their website to begin shopping. Choose a delivery date and click 'Buy now'. Enter a message to be included with your flowers. Enter your Post A Rose promo code in the box provided and click 'Submit voucher'. If you've enjoyed shopping at Post A Rose, you might also like to check out more great deals on flowers and gifts at stores like BuyaGift and A1 Gifts. Or, if those aren't up your street, you'll find plenty more stores to browse in our Flowers and Gifts section. A lot of people cannot imagine shopping at Bunches.co.uk without using coupons. 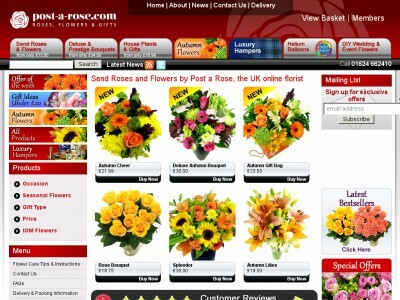 We don't blame them - shopping in Flowers & Gifts category is much easier thanks to voucher codes. Interflora , Value Flora always offer up-to-date coupons and discounts - check them out immediately! Enter your Post A Rose voucher in the box provided and click 'Submit voucher'. Enter your payment details and click 'Submit transaction' to complete your purchase. Standard UK delivery is free on all orders. Next day and specified day deliveries are available for a small fee. Need to contact the team at Post A Rose? Whether you have a question about your order, want to know more about a specific bouquet or simply want to find out how you could make big savings with a Post A Rose discount code, you can contact the Customer Services department by telephoning 01624 662410. Want to find out more about what's happening at Post A Rose? The company maintains a profile across all your favourite social media networks? Follow them for lots of exclusive content such as promotions, gift ideas, competitions and more. You can also use these pages to find out more about saving money with a Post A Rose voucher code. Don’t forget to check them regularly, as you can never be sure when free Post A Rose voucher codes might be waiting for you! Buy now online at www.post-a-rose.com. Post-a-rose.com is perfect for those moments when you need to celebrate or when you’re in the doghouse (fellas ☺), and by using a Post a Rose voucher, you can save big when doing it! A Post a Rose voucher code ensures you aren’t paying more than you need to when having flowers delivered, and best of all, your Post a Rose discount code costs nothing to use and requires no memberships or signups! So grab your Post a Rose voucher, and put a smile on someones face for less!